Over the last seven weeks, to coincide the Olympic Torch Relay, a replica 1948 Torch has made a unique journey in the hands of sailors and boaters of all ages. It has travelled across 80 miles of sea from Torquay all the way to the London 2012 sailing venue as part of the RYA’s 1948 Sailing Relay and has been celebrated by clubs along the route. 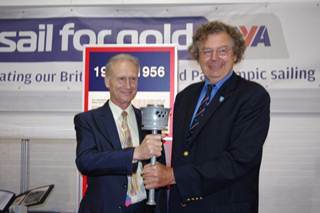 Yesterday (Tuesday 10 July 2012), the Torch was officially gifted from Torbay Council to the Weymouth and Portland National Sailing Academy (WPNSA) and was presented to WPNSA Chairman Edward Leask by the Mayor of Torbay Gordan Oliver. “It’s a great honour to have the 1948 Torch here at the academy and to have it presented to us today by Torbay Council. We are delighted to have it here and hope to display it alongside a 2012 Torch permanently in the Academy” said WPNSA Chief Executive John Tweed. Tony Wood, RYA Regional Development Officer who has been instrumental in organising the event said: “It’s fantastic to be able to officially mark the end of this unique journey. Clubs have been holding the most amazing celebrations and people of all ages have been supporting the Relay and sailing alongside the Torch as it travelled from venue to venue. We really are delighted to have been able to use this opportunity to inspire so many people about sailing and the Games and celebrate our Olympic Sailing Heritage”. The Relay began on May 20 when it was sailed off the beach in Torbay which was the venue of the 1948 Olympic Sailing Events. During Jubilee weekend, hundreds of people passed the Torch along Topsham’s ‘long table’ which stretched right around the village. In Exmouth people came out in force to witness a spectacular send off when the Torch was relayed by dozens of adults and children to a waiting cruiser and pupils at Sidmouth College took part in their own mini torch relay at school! The Mayor of Torbay Gordon Oliver said: “This is a very historic occasion for Weymouth and Portland and Torbay. It brings together the spirit of past Olympics with inspiration for the 2012 Games and beyond. The connection with our replica Torch and the hosting of the 2012 Sailing Events here at WPNSA is fantastic for the sport, young people and this country”. Along with the 1948 Torch a hand drawn map of the original 1948 Torch route by local artist Brian Wright was also presented. The Mayor of Weymouth and Portland and the Mayor of Portland were also present for the celebrations. The 1948 Sailing Relay Torch visited the Royal Torbay Yacht Club, Paignton Sailing Club, Brixham Yacht Club, Babbacombe Sailing Club, SeaSports SW, Teignmouth Corinthian Yacht Club, Starcross Yacht Club, Topsham Sailing Club, Lympstone Sailing Club, Exmouth Sailing Club, Sidmouth Sailing Club, Beer Sailing Club, Axe Yacht Club, Lyme Regis Sailing Club, Castle Cove Sailing Club, Weymouth Sailing Club, Osprey Training Centre and SailLaser. The 1948 Sailing Relay is part of the nationwide initiative Sail for Gold which aims to bring the excitement of London 2012 as close to home as possible for everyone no matter where they live. To mark the end of a very unique journey, a replica 1948 Torch which has been carried almost 80 miles by sea, is to be gifted from Torbay Council to the Weymouth and Portland National Sailing Academy (WPNSA) next week (Tuesday 10 July). 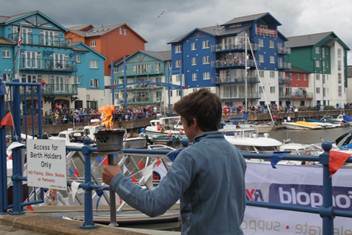 The Torch has travelled by water from Torquay all the way to the Olympic and Paralympic sailing venue as part of the 1948 Sailing Relay and has visited 16 sailing clubs along the way. “We are overwhelmed with the response we have had from this Relay. Since it began in Torbay on 20 May, sailing clubs across the coast have been holding the most fantastic celebrations with sailors and windsurfers of all ages welcoming it and sailing alongside side it, as it travels from venue to venue” ” explains Tony Wood, RYA Regional Development Officer in the South West who has been instrumental in organising the event. During Jubilee weekend, hundreds of people passed the Torch along Topsham’s ‘long table’ which stretched right around the village. In Exmouth people came out in force to witness a spectacular send off when the Torch was relayed by dozens of adults and children to a waiting cruiser and pupils at Sidmouth College took part in their own mini torch relay at school! During the 1948 Sailing Relay hundreds of school children were able to experience a piece of Olympic Sailing history. “In the South West there is such a wonderful local connection to the 1948 Olympic Sailing Events which took place in Torquay and this Relay has been a truly fantastic opportunity to showcase the 1948 Torch once again and to celebrate our sailing heritage” Tony concluded. The Major of Torbay, Gordon Oliver will be officially presenting the Torch to Chairman of the Weymouth and Portland National Sailing Academy, Edward Leask, on the final day of the Relay at 12:30pm at WPNSA. Mayor of Torbay, Gordon Oliver, said: “Torbay has strong links with the Olympics with the 1948 sailing events being held in Torquay. The Olympic flame was brought from London to Torre Abbey Meadows and the closing ceremony was observed by over 10,000 spectators. The 1948 Sailing Relay Torch has visited the Royal Torbay Yacht Club, Paignton Sailing Club, Brixham Yacht Club, Babbacombe Sailing Club, SeaSports SW, Teignmouth Corinthian Yacht Club, Starcross Yacht Club, Topsham Sailing Club, Lympstone Sailing Club, Exmouth Sailing Club, Sidmouth Sailing Club, Beer Sailing Club, Axe Yacht Club, Lyme Regis Sailing Club, Castle Cove Sailing Club, Weymouth Sailing Club, Osprey Training Centre and SailLaser. The 1948 Sailing Relay is part of the nationwide initiative Sail for Gold which aims to bring the excitement of London 2012 as close to home as possible for everyone know matter where they live. Yachting Monthly’s Deputy Editor Rob Peake put the RYA’s Cruising Manager Stuart Carruthers through his paces this week in an in depth interview on the continued development of wind farms in UK waters and their impact on recreational boating. You can watch the full interview at www.rya.org.uk and at www.yachtingmonthly.com. Rob Peake said: “I learnt a lot from talking to Stuart and I think anyone watching the video will learn a lot too. “We covered a huge amount of ground from how we arrived at the current Round 3 developments, what the practical implications of the wind farms are on boating, to what the RYA has been, and is currently doing, to safeguard our interests. “We talked about some of the key issues including the proposed development of the Navitus Bay wind farm on the south coast, the developments in the Irish Sea and the Firth of Forth and the further development of the east coast”. Stuart Carruthers said: “There is no doubt that the waterscape has changed and will continue to change for recreational boating. Our commitment is to keep working to ensure that Government and the developers take into account, at every stage, the safety of navigation for recreational boating”. 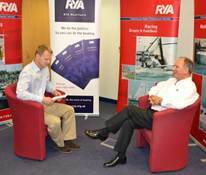 Watch the interview at www.rya.org.uk and www.yachtingmonthly.com. Next week the RYA’s Olympic and Paralympic exhibition ‘Our Sporting Life – Sail for Gold’ heads to Cowes Yacht Haven, Cowes, Isle of Wight for the weekend of the Round the Island race (29 June – 1 July) on the sixth leg of its tour of the UK. 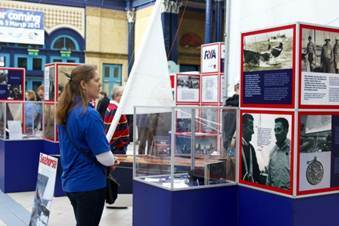 Having already visited London, Scotland, Liverpool and Cornwall, some 16,000 people have had the opportunity to enjoy the exhibition and immerse themselves in 112 years of triumph and glory at this extraordinary exhibition celebrating Britain’s unique Olympic and Paralympic Sailing heritage. Anyone visiting the exhibition will discover how Britain cemented its place as the world’s most successful Olympic and Paralympic sailing nation through the captivating anecdotes, photographs and keepsakes of those sailors who made sailing history. From ‘yachting’s’ debut as an Olympic sport at Paris 1900 to Britain’s record-breaking medal haul at Beijing 2008, the exhibition lets you into the secrets behind the success including how the boats, the racing and the sailors have changed dramatically over time. Stories are brought to life through a creative mix of fascinating historical artefacts and modern-day videos, linking our wonderful sailing past with the London 2012 Olympic and Paralympic sailing regattas taking place on this summer. “We are delighted to be bringing the exhibition to Cowes Yacht Haven over the weekend of the Round the Island race giving even more people get the chance to come along and really get a feel of how wonderful and exciting our Olympic and Paralympic sailing history really is. “The exhibition will give visitors an insight in to just how times have changed and hopefully will get them excited about the upcoming Games and get them right behind our competing sailors”, commented Sail for Gold Exhibition Coordinator, Celia Edgington. From the Isle of Wight the exhibition will go take its place down in Weymouth as part of the Weymouth Bayside Festival for the duration of the Olympic Games, before heading to its last scheduled stop at Brightlingsea Sailing Club in Colchester. Watch the trailer at http://www.youtube.com/watch?v=0FeVaz4LCqk&feature=player_embedded#! This weekend (23/24 June) sees the 2012 Powerboat GP RYA British Championships head to Cardiff Bay for the Nottingham Powerboat Racing Club’s Cardiff Bay Powerboat Grand Prix. Around 40 teams are expected to make the journey to Wales for the third round in the 2012 Championship battling it out in six different classes to become British Champions. Reigning British Champion Mark Williams will be looking to continue his top form in the T850 class and take a hat trick of Grand prix wins as the competition heats up with its move to Cardiff Bay. Meanwhile 2011 World F4 Champion Scott Curtis (Norwich) will be hoping the gremlins he suffered in the first round at Oulton Broad are now behind him and he can once more continue in his campaign to take the F4 British RYA Championship for the second consecutive year. 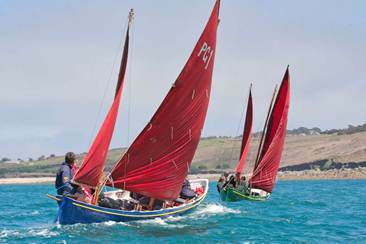 But with a strong fleet of boats and a very competitive Paul Vears (Essex) hot on his heels – he’ll have a battle on his hands! Staffordshire’s Tiegen Goodfellow (10), as one of the youngest competitors of the weekend and one of the few female racers, will look to try and close the gap on GT15 World Champion Ben Jelf and Thomas Mantripp (Lowestoft), as seven youngsters’ battle it out in the GT15 class at speeds of around 40mph. The GT30 class looks set to bring some great entertainment as the battle for the championship continues and we can look forward to an almighty ‘clash of the titans’ from the F2 class which has a strong number of drivers who are all eager to gain championship points. Competitors will compete in five Circuit classes competing for qualifying then over three heats to become the Cardiff Bay GP Winners. In addition there will also be Offshore action from the support class from the UK Formula Future Offshore Race Club in the form of the E1500 class who will get there season off to a flyer with seven teams battling it out to take the vital points in their championship opener. Defending champions Jake Swann and Ben Kendall will face fierce competition from Southampton’s Mick Pritchard and Arron Joyce as well as seasoned racers from Devon Bob McCarthy and Ross MacGregor. 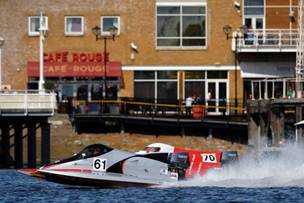 “Cardiff Bay is a fantastic venue that lends itself to Powerboat Racing” explains RYA Powerboat Racing Officer Nikki Drummond. The fast and furious on water action will begin at 10am on both days with back to back action throughout the day until around 4pm. Gavin Saunders from Constantine, Falmouth has clinched a place in the final of the ilovesailing Facebook photo and video competition. As the May winner, Gavin wins a Go-Pro Surf Hero camera thanks to Action Cameras and a much coveted ilovesailing rubber duck, and will join fellow monthly winners in the final. With so many wonderful pictures and video’s posted in May two runners up were chosen; Beth Matthews, for her picture of entitled ‘How summer sailing should be’ (https://www.facebook.com/emma.slater.505#!/photo.php?fbid=4018400297451&set=o.298756330172477&type=3&theater) and Phil Brining for his family focused video (https://www.facebook.com/RYAILoveSailing/videos#!/photo.php?v=230473837057962&set=o.298756330172477&type=2&theater). Both Beth and Phil win themselves a much coveted ilovesailing rubber duck. Each month, between January and August 2012, we will choose a winning photo or video that celebrates what we love about sailing and windsurfing; that will then go through to the ilovesailing grand final to be held at the PSP Southampton Boat Show in September. The overall winner will claim a fantastic money can’t buy prize package which includes a Neilson sailing holiday, a day of personal coaching with a top coach, a Skandia Team GBR goodie bag, an ilovesailing rubber ducky signed by the 2012 Team GB Olympic sailors and more goodies collected throughout the months leading up to winners announcement. “The entries just keep coming and every one we see is fantastic, making our job to choose one winner each month very difficult indeed. “It’s great to see so many people getting involved and sharing their photos and videos with us. We look forward to even more entries over the coming months and more and more people liking ‘ilovesailing’” commented ilovesailing manager, Graham Manchester. Open to everyone, all you need to do to take part is ‘like’ the ilovesailing Facebook page www.facebook.com/RYAILoveSailing, start posting your favourite sailing and windsurfing photos and videos and you could be in with a chance of winning. It’s that easy. Each week you’ll also find different activities to enjoy on the page including caption competitions, opinion polls and more. Get involved and you could become the proud owner of your very own ilovesailing duck!